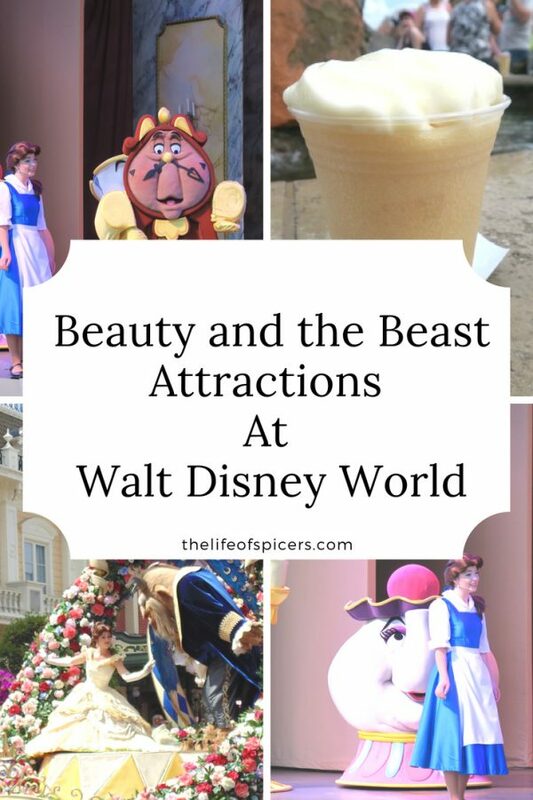 Being a huge Beauty and the Beast fan, I always try to make sure our holiday itinerary features Beauty and the Beast as many times as I can. 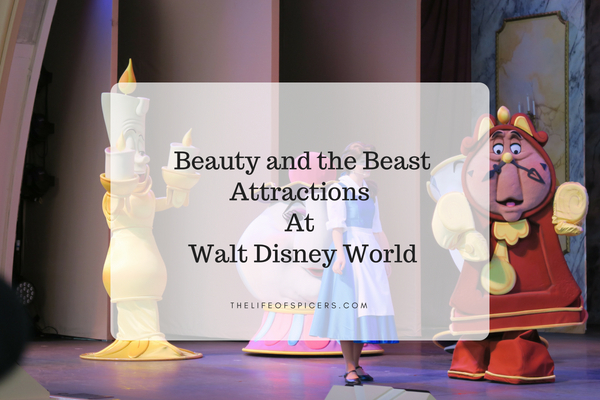 There is plenty of Beauty and the Beast at Walt Disney World, and I recommend you experience all of it.. 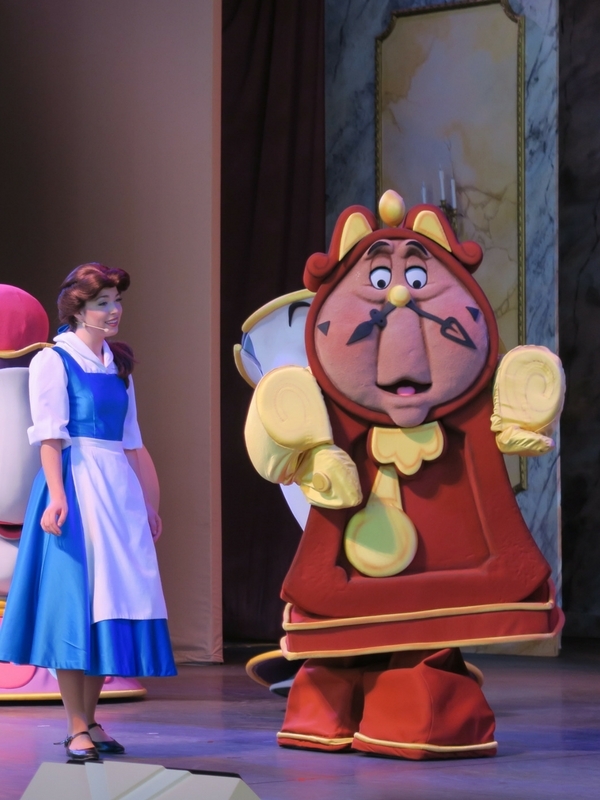 The Beauty and the Beast show at Disney World is otherwise known as Beauty and the Beast Live on Stage. Located in Hollywood Studios, this is a 25 minute show in an open air covered theatre. The West End style live show does an amazing job of telling the story of Beauty and the Beast in it’s 25 minute slot. The characters are all brilliant and I don’t know how they manage it in the heat, but they do and they do it really well. The theatre is so big you won’t need a fastpass for it, and there are plenty of shows scheduled each day so it’s not an easy one to miss. Enchanted Tales with Belle is a lovely attraction in Magic Kingdom in Fantasyland. You can be part of the show or watch from the audience as Lumiere narrates. 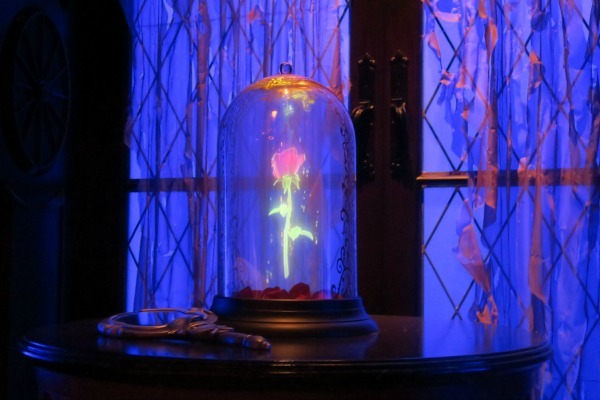 As you go into the interactive attraction, you begin in Maurice’s workshop before arriving in the Beast’s library to see the show. Belle is the star of the show in her yellow dress and even if you’re not taking part you can have your photo taken with her at the end which is a lovely touch. Enchanted Tales with Belle can be Fastpassed, however on a quieter time it’s not always necessary. Be Our Guest restaurant isn’t a character meal, however the beast does make an appearance during the dinner service. You will have the opportunity to see the beast walk through the restaurant and on your way out of the castle, there is the opportunity to have a photo taken with the beast. The Be Our Guest restaurant is a sight to see in itself. The themeing is amazing, with three dining rooms, the grand ballroom, library and the west wing. Wherever you sit for your meal, you will have the opportunity to wander through the different dining rooms to take photos and absorb the atmosphere. You have the opportunity for Princess Storybook dining at Akershus restaurant in the Norway pavilion in Epcot. Akershus is a character restaurant featuring selected princesses, however you get a special meet and greet with Belle in her yellow dress on your way into the restaurant. Akershus serves a mix of buffet and menu items with a Norwegian twist. It’s often a cheaper princess character meal than Cinderella’s Royal table as Akershus is a one table service credit meal opposed to Cinderella’s Royal Table being a two table service credit meal on the dining plan. Head inside Gaston’s Tavern in Fantasyland in Magic Kingdom. You can refresh with a Le Fou’s brew, one of my favourite ways to spend a snack credit in Magic Kingdom. 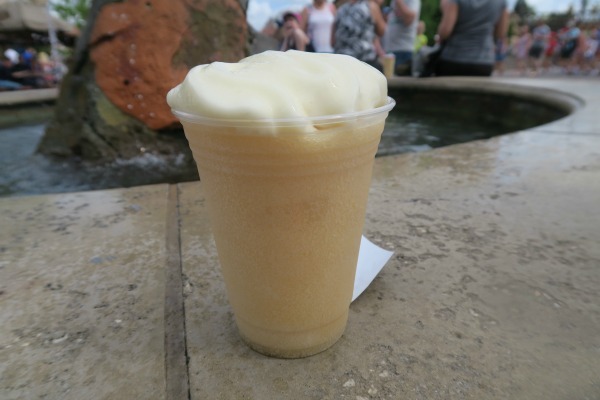 Le Fou’s brew is a mix of spiced apple juice and marshmallow served as a frozen crush drink. You can also purchase a cinnamon roll that is easily enough to satisfy two people for breakfast. A great way to start the day in the themed quick service location. Gaston is available for a meet and greet outside of Gaston’s Tavern in Magic Kingdom. He will have you in stitches and is well worth queueing for. I suggest planning your questions before you arrive, perhaps show him your muscles and see what he does. 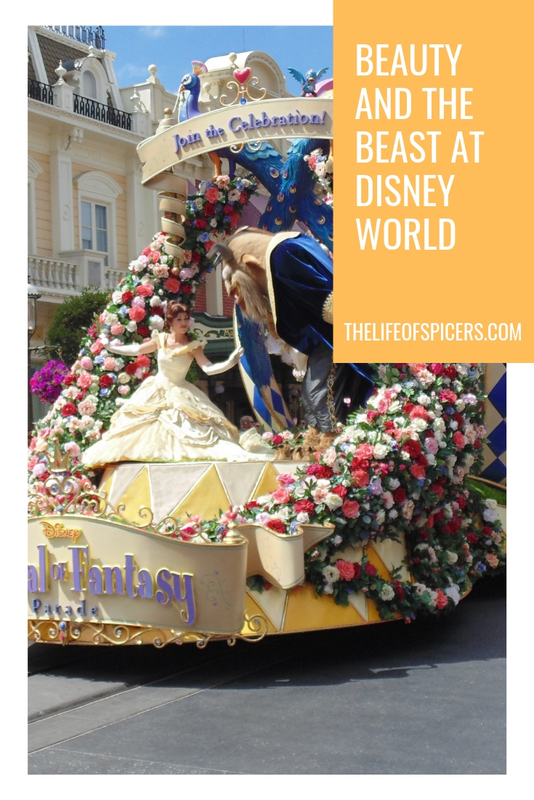 The afternoon Festival of Fantasy parade in Magic Kingdom is a great way to see Belle and the Beast as they lead the parade through the streets of Magic Kingdom. 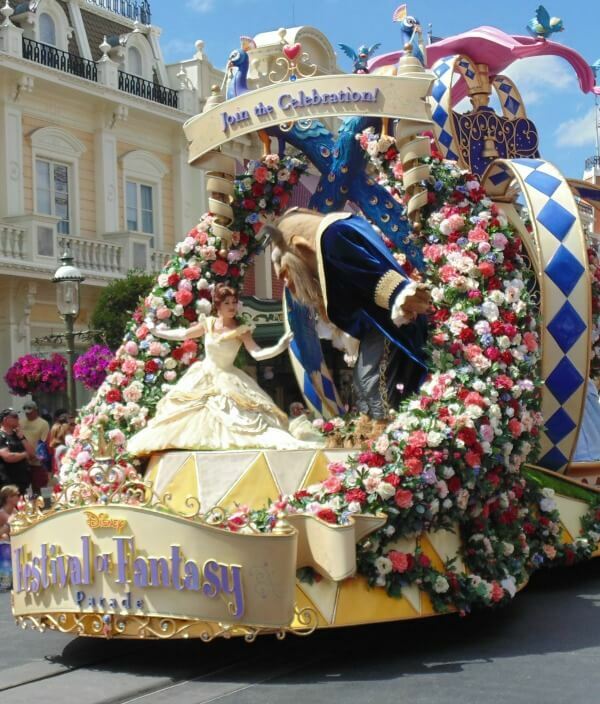 The Festival of Fantasy parade happens every day weather permitting at 3pm, starting in Frontierland and finishing at the front of the park at the end of Main Street. You can take the opportunity to meet Belle in the France pavilion in Epcot in her blue dress. She is a lovely character to meet and have a lovely chat with as you make your way around the World Showcase. 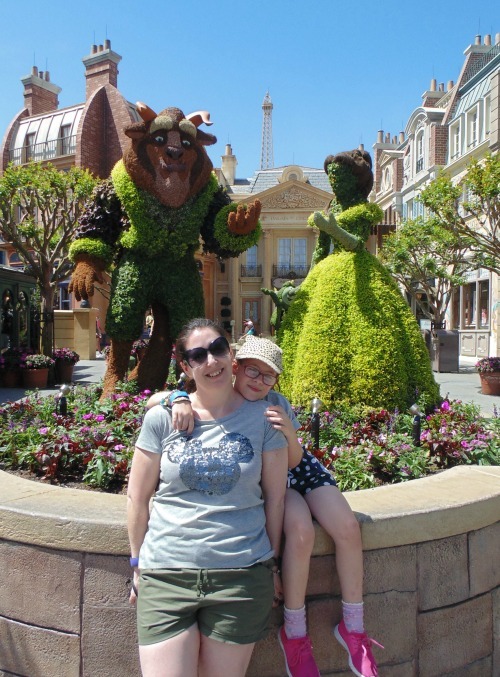 The meet and greet location for Belle in France also has quite a few trees dotted around so often the queue can be shady which is a bonus in the hotter months. I am exctatic about going to Be Our Guest next week. Do you happen to know if we will be able to get a picture with the Beast during the lunch time? Or is he only available during the dinner time? he’s only there for dinner service unfortunately. You see him on the way out so there may be a slight chance you see him if you had a very very late lunch that went into dinner service.